$10 Reservation Fee The day of the event you will receive a $10 Bear Paw Coupon! HAVE YOU EVER WONDERED HOW BATIKS & DIGITAL PRINTS ARE MADE? Carolyn Williams, our Hoﬀ man Fabric representative will present us with the story of Hoﬀ man fabrics and what makes them the leader in this industry. Carolyn will present a video and talk about the process for making their batiks and digital prints. See her trunk show of upcoming fabrics and designs. Call or stop by to make your reservation - Limited seating available All attendees will RECEIVE A GIFT and an opportunity to WIN A GRAND PRIZE! We will be demonstrating new products we’ve found and some old favorites. Each time you come to one of our Demo Days, you will receive a portion of a free kit. At the end your 3 visits, you will not only have seen some great products or fun ideas, but you will also be able to finish our featured free project! Bear Paw has joined the Greater Spokane Area 2019 Shop Hop! We have a new blue bag that everyone will want! Save your Bear Paw Quilting sales receipts from January 2, 2019 through February 28, 2019 until you have $150 in total sales. Bring them in and receive your FREE 5th Saturday Bag. If you participated in our Blue Bag Sale last year, save your January & February 2019 receipts to equal $150. Bring them in along with your bag and we will attach your 2019 tag. 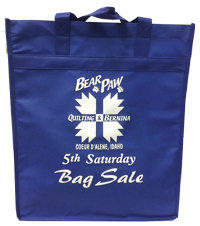 Purchase one of our Bear Paw Canvas Tote Bags and use it to stow your purchases. Each time you do this you can enter your name into our monthly drawing for a free gift from Bear Paw! 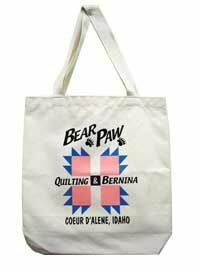 Help keep our earth green and use a Bear Paw Quilting Canvas Tote!